Disclaimer: Although I hope you find it helpful, the guest poster is not a medical professional. Information in this post is not a substitute for your own doctor’s medical care or advice. About a year ago, I caught a cold that my son brought home from preschool. A week later, just as I was starting to feel better, he gave me another cold. Suddenly, I couldn’t breathe, and my Ventolin inhaler was useless, so I made an appointment with my primary care physician. I’d always had hay fever; allergies had been part of my life since I was young. I grew out of childhood asthma around age four, but it returned in college, during peak allergy season, and I had a Ventolin puff inhaler that I only used once every couple of months. Now I was taking “rescue” treatments of albuterol with the nebulizer four times a day, plus twice-daily nebulized treatments of the steroid budesonide. I was also taking Benadryl to mitigate some symptoms, since allergies are a strong contributing factor to my particular “brand” of asthma. Because I’m hypersensitive to side effects, I couldn’t take Claritin, Allegra, or Zyrtec. And every time I caught a cold, it turned into bronchitis. So what’s a girl to do? After 18 years as a technical writer, editor, and medical writer, I had extensive research skills and the ability to understand papers published in peer-reviewed medical journals, so I put those skills to work. I discovered that the typical American diet of processed food, preservatives, and artificial colors and flavors were contributing to asthma, creating record numbers of asthma in children and adults. And I discovered that kiwi had been found to improve asthma symptoms up to 40% in children who ate a single kiwi five to seven times a week. Then I stumbled across multiple blogs online, most by mothers who had eliminated or reduced their children’s asthma, and I , had the most extensive, exhaustive list, and those items are included in the detailed list below. 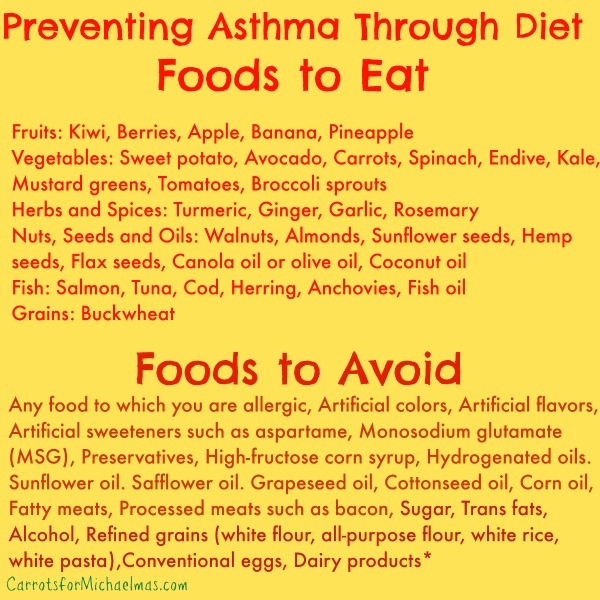 I began compiling a working list of foods that could relieve or exacerbate asthma symptoms, and started incorporating the “good foods” into my diet. Within 18 hours of eating the first kiwi, I cut out a breathing treatment. That day, I had three “rescue” treatments with albuterol, instead of four. Clearly, there was a practical application of the research findings and the other moms’ advice. I’m still working on getting rid of many of the offending items from the “avoid” list, but I just can’t give up the occasional Oreo or bacon. 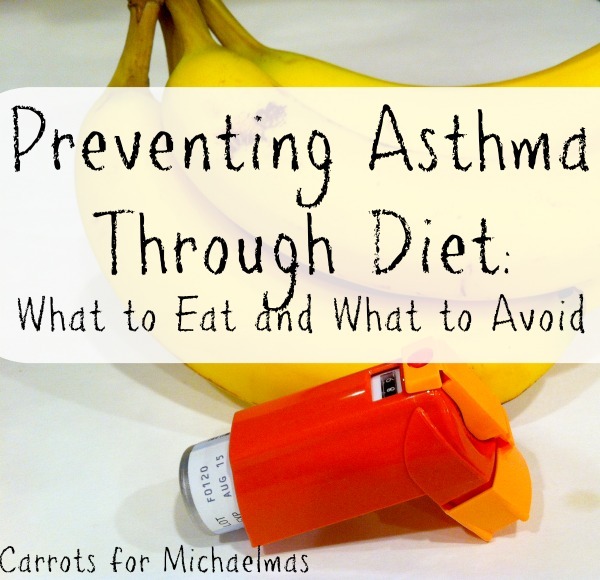 I do find that my symptoms are lessened when I avoid the wrong foods and add in the right foods, but the asthma hasn’t disappeared, by any means. Of course, the list below is not comprehensive, and allergies or food sensitivities may preclude you from incorporating some of the items. But it’s a start. Try some of the items below, and you just may find that you can take control over asthma instead of letting it control you. Note: It’s hard to find broccoli sprouts in Phoenix, so I only have them at Sweet Tomatoes/Souplantation’s salad bar. Note: Look for oils that contain the ideal ratio of omega-6 to omega 3, which is 2.5:1. Too much omega-6 without the appropriate ratio of omega-3 can exacerbate asthma symptoms. Note: For fish oils, my physician recommends that the gel capsules be stored in the freezer. Just take the appropriate quantity daily while the pill is still frozen. This reduces the chance that you’ll be burping up a disgusting fish flavor all day. Note: This is added to the list because it is typically non-allergenic, and many people with multiple food allergies can still eat buckwheat. If you can’t, then take it off the list. Some people have found that eggs and dairy can contribute to symptoms. Others have issues with peanut butter, chocolate, corn, or wheat. I tried going without dairy (for at least a week) and it had no effect on me. Clearly, that is not one of my triggers, but this may differ for others. You may find that even if a food doesn’t contain the problem ingredients above, it can still exacerbate asthma symptoms. For example, I notice an immediate shortness of breath if I eat spicy buffalo-wing-style pretzels, even though they don’t contain artificial food colorings or other red-flag ingredients. I love them, but if I eat them, I pay for it. Healing the New Childhood Epidemics: Autism, ADHD, Asthma, and Allergies: The Groundbreaking Program for the 4-A Disorders by Kenneth Bock, M.D. Kathy Dix Biallas is a native of southern Illinois (Collinsville, the horseradish capital of the world) who packed a suitcase and moved to Arizona in 1996 after receiving a Bachelor of Arts in English Literature from Knox College in Galesburg, Ill. She enjoys cake decorating, jewelry-making, singing, and reading as many books as possible. She is a business analyst and technical writer for a software company. She is married and has a four-year old son, who loves Matchbox cars and has no interest whatsoever in what Mommy does all day. Psst! This is your chance to grab your copy of the Ultimate Healthy Living Bundle at an amazing price. Ultimate Bundles offers my favorite sales of the year and the 2016 bundle is one of the best yet! 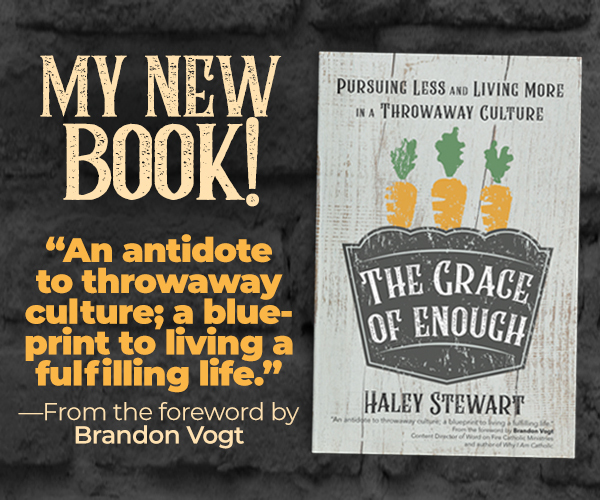 Check out the great eBooks and eCourses (plus over $250 worth of bonus products!) that can benefit your family for just $29.97. 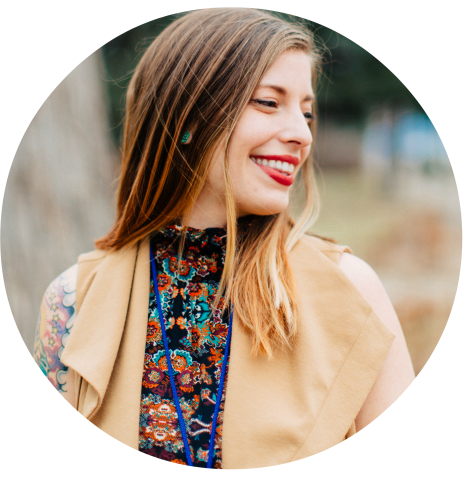 The Ultimate Healthy Living Bundle removes the overwhelm of finding quality resources to help you take charge of your own health. 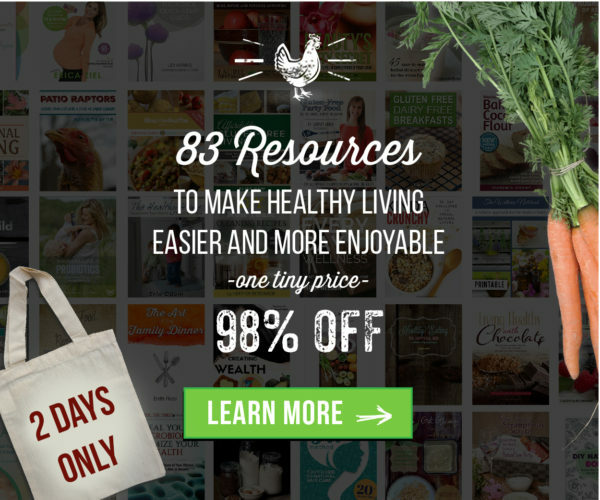 It’s a treasure trove of wellness resources on everything from women’s hormones to healing your gut to paleo eating to raising healthy kids. But it’s only available for TWO DAYS! As I said, the sale only lasts for 2 days (ends December 29th), so don’t miss it! Just a few hours to go so don’t miss it! Links to Ultimate Bundles are affiliate links which means that (at no additional cost to you!) a portion of sales made will benefit my family. Thanks for supporting Carrots! Thanks, Kathy! I love to hear about healing through diet. It seems like the modern diet can be implicated in everything from asthma to autism. 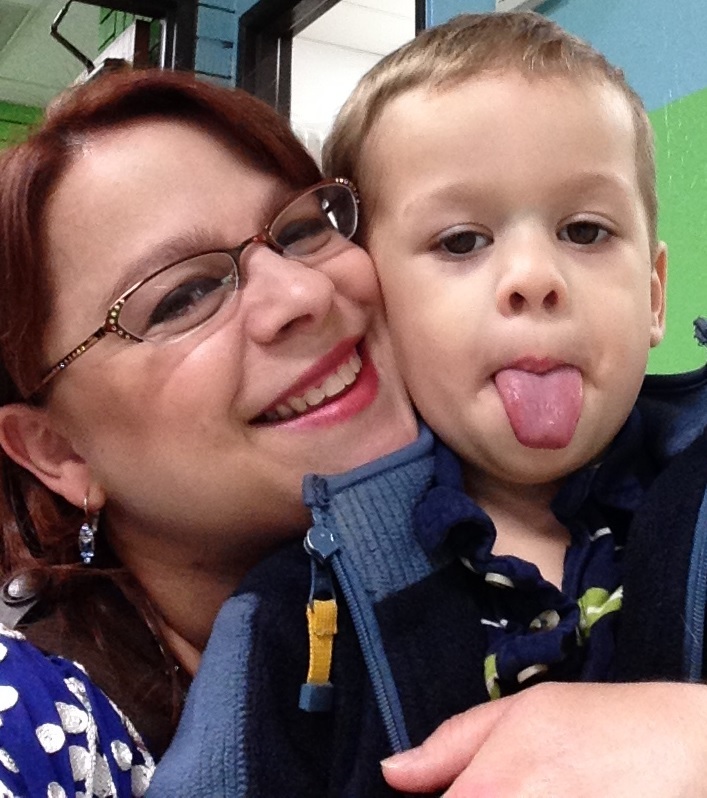 My family had immediate and astounding success treating our son’s autism with dietary intervention a few years ago, and that experience has permanently changed the way we think about food. I got really passionate about it for a long time and urged my friends and family to change their diets to help keep their families healthy, but people were actually pretty hostile to the idea and started referring to me as a “health nut”. So it’s nice to hear from someone who understands the important role food plays in everyone’s specific health puzzle. Thanks for sharing! This looks like stuff everyone should be eating! But seriously, I developed breathing problems after being hospitalized with pneumonia in 2010, and I’ve definitely found that my diet affects how often I need my inhaler. Too much starch or sugar was a big culprit, although before I started getting better, I was reacting to coconut, nuts, beans, citrus, everything! At my worst, I couldn’t even take communion without medicating afterwards. I hear you! My grocery store has an $8 kiwi peeler; you might want to check that out. But the easiest way, without special tools, is to rinse the kiwi. Then cut it in half. Insert a spoon closely between the skin and the fruit and swoop it around. I use my fingernail to remove the hard ends. There are videos online with detailed instructions, if you’re more of a visual person. Thanks for the list of foods to eat/avoid! I have had asthma since I was younger, and have been vegetarian for years, but after I went vegan and try to limit gluten (okay, I just get the gluten free pasta, but I still eat bread) I rarely use my inhaler and stopped taking asthma medicine completely. Maybe all that garlic and turmeric helps too — I add an excessive amount of those to almost everything. Anything that helps, right? Although I’ve made dietary changes, they’re still in progress, and I still need pharmaceutical help — aka Benadryl, albuterol, and Singulair. But I’ve certainly noticed an improvement just related to adding in more good foods and reducing the number of bad foods. My Indian colleagues often make enough food to share, so I do get a decent amount of turmeric and garlic and onion just through their home cooking. this fantastic ppost at at this place. Am i the only one confused that you should eat sunflower seeds but not sunflower oil? Great question! I’m guessing it’s because the seeds are whole, whereas the oil is refined, processed, or something similar. And supposedly, the purest, least-refined form of a food is supposed to be best for anyone suffering from an autoimmune disorder like asthma, with a few notable exceptions — such as tomatoes, whose lycopene is more bioavailable after they’ve been cooked. I still eat my daily kiwi, and try to get sweet potatoes as often as possible. If I don’t have time to cook them, I’ll grab a Gerber squeezy fruit pouch (sweet potato, apple and cinnamon), or I’ll get a baby-food container of puréed sweet potato to add to our dinner — it’s invisible in sauces or soups. I can also add it to pancakes, muffins, zucchini bread, etc. Good luck!